replacing a mature natural tree with a 'ten sapling Wood Farm'. You might fell a rain forest to plant more trees than were there before, but you just produce a wood-growing facility and not the original complex life-producing wooded environment that millions of creatures need to call 'Home'. Please do all you can to save Jungles and Forests, and plant more Trees. [Above] WoW Volunteer, Helen Cave, dressed as a Mermaid to help publicise the WoW Water Palace Exhibition. [Above] Sister Chris Churchill & long-term Hospital patients Tony Grana-Priego and Tommy Burn at WoW storytelling visit to Woodlands Hosp. with WoW Volunteers Andrea Russell, Trevor Hinds, Wendy Tabrizi and the MC Trevor T.
Stuff called 'post- consumer waste' stops being 'waste' if it is reused! Call it 'Salvage'. Be kind to all resources - give everything possible, a lasting, useful, eco-friendly life! As paper and print industries evolve their eco-responsibilities, we can all help them to evolve better by buying more recycled paper and insisting on less optical brightening agents, more soy-based inks and citrus cleaners. Everytime there is a WoW event or we have an important announcement to make, we produce a poster design and upload it to our server so it can be accessed by our supporters, downloaded and printed worldwide on demand. All of our posters are produced by guest artists. You can be a creative supporter and design a poster for WoW by contacting us for details. Powerful Posters can provide the ideal focal point for classroom activities or can help to change the World. We attract sponsors for all our publications. With their help, we spread the WoW Campaign further afield, bit by bit. If you know those who you think would enjoy supporting us, please put them in contact with us; thank you. Finding those who care and understand the importance of our message is a never-ending journey that we make, naturally and simply. 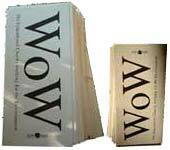 For example, the paper supplier, The Donside Paper Company Ltd. in Aberdeen and the printer Louis Drapin Ltd. in Birmingham sponsored our first ever WoW leaflet ( right ) and without their help, we would not have been able to spread word of our aims in the days before the Internet. It takes a leap of faith to 'move-on' and adopt new technologies, but as we stride forward, we all should support every new chance to create an ever healthier life on an ever healthier planet. Sadly, there remain some who through tradition, greed or ignorance, still live without sufficient care for tomorrow's World. Only a mix of pressure, re-education, law changes, technological advances, discoveries and penalties will help. We all need to 'know more' and support better ways.